Several articles in recent years have claimed that more diversity in the sense of fewer economists on the Board of Governors and the Federal Open Market Committee (FOMC) would be a good thing (Fox “How Economics PhDs took over the federal reserve”; Zumbrum “Fed draws on academia, Goldman for recent appointees”; Calabria “Yes Fed has a diversity problem”; Ricketts “The Fed could use less book learning and more street smarts”). This is of some importance. There currently are three vacancies out of seven positions on the Board. One will be filled by the Vice Chairman for Bank Supervision. Several of the twelve bank presidents have turned over in the last few years and more may well turn over in the next few years. This clamor seems to having an effect or at least reflects an opinion held by Reserve Banks’ boards of directors. The number of Ph.D. economists heading Federal Reserve Banks has fallen in recent years. Three presidents who were professional monetary economists and took strong stands have left, Naryana Kocherlakota, Charles Plosser and Jeffrey Lacker. The first two have been replaced by non-economists and the latter may well be also. Positions at the Board are different than Reserve Bank presidents. Some positions at the Board are allocated to community bankers or bank supervision (Calabria 2016). The number of professional monetary economists who are community bankers is small and there is no reason to think that such a community banker would know more about monetary policy than other community bankers. The most important qualifications of the Vice Chairman for Bank Supervision concern knowledge about regulation (Davidson and Tracy 2017). There are qualifications for Board members based on geographic distribution that should be taken seriously (Calabria 2016). These assorted criteria do not apply to Reserve Bank presidents. Furthermore, the operational work at Reserve Banks of clearing checks has disappeared and Reserve Bank’s most important roles concern monetary policy and supervision and regulation. Supervision and regulation at Reserve Banks is a Board function delegated by the Board to Reserve Banks. In the end, the Board is in charge of supervision and regulation. If there is a reason to have Reserve Banks, monetary policy is it. Reserve Bank presidents have their own economics staff to brief them, a luxury that members of the Board of Governors do not have. Some of the Reserve Bank presidents who are economists have been quite effective at raising issues about monetary policy such as the desirability of the Federal Reserve’s holdings of mortage-backed securities. Nonetheless, some think monetary policy would be better if fewer Presidents of Reserve Banks were economists. Would it? There are two aspects of being a policymaker at the FOMC. Monetary economists have some expertise at one and substantial expertise concerning the other. The FOMC sets the specific goals of monetary policy. The general goals are set by law but the specific goals in terms of inflation and real economic activity are determined by the FOMC. (I think it would be better if specific goals were set by Congress and the Administration but they are not.) Monetary economists have some expertise at determining the goals because they have thought about them more than most people, but staff assisting presidents provide this knowledge to some extent. The FOMC’s other task is to use monetary policy tools to produce the goals. Whether or not members of the FOMC are economists, economists brief presidents of Federal Reserve Banks before FOMC meetings and monetary economists have particular expertise concerning these issues. It takes serious economic analysis to understand how monetary policy worked even before the financial crisis. That is more true today. There is not a consensus among monetary economists about how monetary policy works in the context of current policies such as interest on excess reserves and Quantitative Easing. (Or for that matter, even what the effects of Quantitative Easing are.) A Principles of Economics course is not sufficient to have the economics background to reach an informed judgement about how monetary policy works today and why alternatives are in error. An undergraduate economics degree twenty or thirty years ago is of no more use. While it is possible for an economic advisor to teach a non-economist enough to understand the issues, it is difficult to imagine a policymaker ignoring the judgement of the economists who brief him or her. Some non-economists have been involved enough in monetary policy issues to have strong opinions before they are appointed. (Quarles is an example of someone who is being considered and has at least one strong opinion about monetary policy (Davidson and Tracy 2017).) Many if not almost all have not. Economic advisors provide informed analyses and the FOMC meetings are informed discussion of the economy and monetary economics. Some policymakers are comfortable with briefings that reflect different opinions. Some are not. The judgements of the economists providing the briefing will play an important role in the choices made by a president, whether there is one point of view or more than one. The economists briefing the President will play a far larger role if a President is not a monetary economist. The policymaker’s policy preferences might be different than the staff’s preferences on occasion but even these differences are unlikely to be important. The argument is to appoint more presidents at Federal Reserve Banks who have no expertise in monetary economics and will be on the FOMC. Such appointments are unlikely to increase the level of discourse or the soundness of decisions at the FOMC. If such appointments have any effect, they most likely will enhance the importance of views held by the Reserve Banks’ economics staffs. Calabria, Mark. 2016. “Yes, the Fed Has a Diversity Problem.” Cato at Liberty. June 23, at https://www.cato.org/blog/yes-federal-reserve-has-diversity-problem. Davidson, Kate, and Ryan Tracy. 2017. “Expected Fed Pick on Collision Course with Current Members on Rates.” Wall Street Journal, April 17, at https://www.wsj.com/articles/expected-fed-pick-on-collision-course-with-current-members-on-rates-1492469900. Fox, Justin. 2014. “How Economics Ph.D.s Took Over the Federal Reserve.” Harvard Business Review, February 3, at https://hbr.org/2014/02/how-economics-phds-took-over-the-federal-reserve. Ricketts, Joe. 2017. “The Fed Could Use Less Book Learning and More Street Smarts.” Wall Street Journal. April 10, at https://www.wsj.com/articles/the-fed-could-use-less-book-learning-and-more-street-smarts-1491864871. Zumbrun, Josh. 2015. “Fed Draws on Academia, Goldman for Recent Appointees.” Wall Street Journal, November 10, at https://www.wsj.com/articles/fed-draws-on-academia-goldman-for-recent-appointees-1447177296. This entry was posted in Economics, Federal Reserve, Uncategorized and tagged Economics, federal reserve on April 24, 2017 by gpdwyer. Dave Ramsey, who provides generally excellent financial advice, has a page advising “Don’t do it.” While that is good advice, it is not an option for everyone all the time. His advice not to borrow on credit cards is good advice too. Payday lenders make loans to people for small dollar amounts for short periods. Indeed, they get their name from a common practice of making a loan to people until their next payday. Interest rates are quite high compared to say, a car loan. Interest rates on new car loans are in the neighborhood of 1.5 to 3.0 percent and payday lending rates range from 150 to over 500 percent per year. Payday loans are for small sums for short periods of time with a lump-sum payment in a couple of weeks. If the loan is not rolled over, the annual interest rate is misleading. A two-percent interest rate for a week compounded for a year is 180 percent. If a $300 loan is taken out for a week at two percent, that is $6. That is hardly an appalling amount. Studies have found that payday lending often is the cheapest source of short-term credit available to people in short-term financial difficulties. They are not stupid; they have an emergency or have fallen on hard times. The reason for some people’s concern is the failure of some people to pay off the loan, instead borrowing the $306 for another week, and so on until, at the end of year, they owe $840 for the $300. Not a good outcome for sure. Restricting the availability of these loans means that some people will no longer have this source of credit available. They are worse off as they see it. They have to rely on more expensive sources, miss payments on debts they owe or adjust some other way. It is of course possible to think that the government and some of its experts know better than low-income people with bad credit. I think that is just arrogance speaking. If restricting credit is a bad answer, what is a better way to help low-income people with bad credit and financial difficulties? A better answer is to make more credit available to low-income people with bad credit. This will drive down the interest rates. Credit unions in the United States used to make short-term loans to members in small-dollar amounts. I know; I got one while in my twenties after a car accident. The more rules and restrictions are put in place, the more difficult it is for institutions to make loans such as payday loans. The simple economics indicate that increasing the supply of such loans is a solution, not restricting supply. This entry was posted in Financial regulation, Uncategorized and tagged Economics, financial regulation, payday lending on June 3, 2016 by gpdwyer. I went to a Lumen Christi conference last week (may 19-20), a meeting mainly of economists and theologians. The general topic was Catholic social thought and the specific topic was the the environment. At breakfast, I was sitting at a table with three theologians. Somehow it went all wrong and I don’t understand it even after thinking it over. I mentioned that I had been at the Federal Reserve Bank of Atlanta and had left partly because of dissatisfaction with the increases in regulation after the Financial Crisis of 2007-2008. It seemed that they immediately assumed that I thought there should be no regulation of banks or financial markets. Apparently he didn’t really mean it about the 1950s lifestyle. At his session, I brought up the comment about a 1950s lifestyle. I used the enormous advances in medical care for heart disease and the general increase in life expectancy of older people as an example of dramatic improvement since the 1950s. I asked him who should decide whether such research is important. He merely replied that it is obvious that medical research is important while some other research (on phones I am sure) is unimportant. He did not understand that I was asking how his preferences about research would be implemented. That problem is harder if, as I thought, some research would be fine and other research not. To me as an economist, “who decides” means whose preferences get implemented and how. Some people might agree that some research is more important than other research in some sense. I was not merely asking if some people could agree. He most likely does not know that those advances are related. Digital imaging is incredibly important in modern medicine including treatment of heart attacks and preventive medicine. My mother-in-law’s pacemaker has digital storage of its activity that is uploaded to the doctor once a month. I found all of this unsettling in an odd way. One of the theologians commented later about me that “It takes all kinds.” The complete inability to find any way to discuss things despite, at least at the start, some good will is a shame. This entry was posted in Economics, Uncategorized and tagged Economics, environment, theologians on May 22, 2016 by gpdwyer. Governments are starting to regulate Bitcoin and other cryptocurrencies. Is this good or bad? Why? Norbert Michel and I wrote a Heritage Backgrounder piece on Bitcoin and other cryptocurrencies, Bits and Pieces: The Digital World of Bitcoin Currency. We discuss the main aspects of Bitcoin without getting into technical details. We also discuss some of the possibilities for the future and indicate ways that the government can adapt to stay out of the way. We don’t really take a stand on whether Bitcoin itself will succeed; time will tell that. We do point out ways that the growth of Bitcoin and other cryptocurrencies could be throttled by government regulation and laws and suggest ways to avoid that outcome. This entry was posted in Bitcoin, Private digital currency, Regulation and tagged Bitcoin, private digital currencies, regulation on September 17, 2015 by gpdwyer. In the United States, we tend to focus on immigration issues in this country. The system – if it can be called a “system” in any sense – is functioning in a way that almost no one would recognize as sensible. Increased immigration is not unique to the United States. There are many more immigrants in European countries than just 15 years ago. It is fairly common to see people of Asian origin speaking Italian or Spanish on the subways in those countries. Europe has a similar problem today. Thousands of people are fleeing the violence in North Africa. The simplest way is to sail in a boat across the Mediterranean. European countries are confronted by some of the same problems as the United States was then. The first point of entry for many of these refugees is Greece. Greece hardly is in a position to help the refugees much. Permanent employment for an immigrant is a fantasy in a country with an unemployment rate of about 25 percent for the last seven years. So they move on from Greece. Because of the open borders in the European Union, people can travel from Greece to many more attractive countries. Many of these other countries are concerned about the implications of many refugees ill equipped to live outside their native lands. The United Nations should … identify large areas where migrants could both live and work while retaining their nationality. Granted an indefinite stay, these migrants would also have the possibility of attaining citizenship. These areas would, by definition, be empty and probably inhospitable; the UN’s aim would be to make them comfortably habitable. A short version of this: Let them live in the Sahara desert. But wait, that’s in the neighborhood of where they’re leaving. In Europe, I know of no such even relatively “empty and … inhospitable” area. Moreover, it would have to be owned by a government I guess or the owners would have to be expropriated. The U.S. version of this would be: Let them live in Death Valley. What would keep them there when the bright lights of Los Angeles and Phoenix are where they can find gainful employment? “Empty and inhospitable areas” are not a great place to try to make a go of it. What is the solution, or even a good solution? I don’t know. Arguably, free migration with private charity and no guaranteed benefits from the government would work reasonably well in many ways. The current world is so far from this. There are big arguments about immigration, of course. There are two arguments that appeal to me. One argument: with current welfare in place, free migration would be a massive drain on taxpayers in the United States. Another argument: two wrongs don’t make a right. The existence of welfare should not stop a commitment to free migration of people. I incline to the former argument: free migration of people from Mexico and Central America given current institutions in the United States is a recipe for a big new burden on taxpayers in the United States. Actually, under current arrangements, sponsored migration of refugees arranged by private groups seems to work reasonably well when it is feasible. I don’t know of such efforts underway now, although it seems that would be the ideal resolution for these refugees in the United States. It might work reasonably well in Europe. It also would deal with a complaint in the United States right now, that the U.S. government is not doing nearly enough to help Christians being raped and killed by ISIS. This entry was posted in Greece, Immigration and tagged Greece, immigration, refugees on August 22, 2015 by gpdwyer. The end of large-scale asset purchases by the Federal Reserve to implement quantitative easing was announced on October 29. While the Federal Reserve will not decrease its extraordinary holdings of securities, it will not increase them either. By coincidence, this came at about the same time I was giving a talk in Cork, Ireland about quantitative easing by the Fed and by the European Central Bank. Quantitative easing is a policy of large-scale purchases of assets by the Federal Reserve. The Fed has increased reserve balances from about $13 billion before the financial crisis to about $2.7 trillion at the end of October 2014. If that’s not a big increase, nothing is. Many have been surprised by the fact that quantitative easing on this scale has not been accompanied by substantial inflation. As a general rule, increases in bank’s reserves are accompanied by increases in the quantity of money and followed by higher prices. This seems not to be the case for the United States. Why? The nominal quantity of money has not increased at a particularly high rate, let alone an alarming rate. 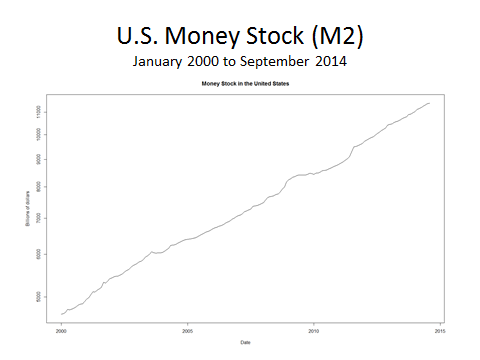 The nearby figure shows the growth of the nominal quantity of money in the United States. The measure used is a standard one, M2, which basically consists of U.S. currency and bank deposits in the United States. 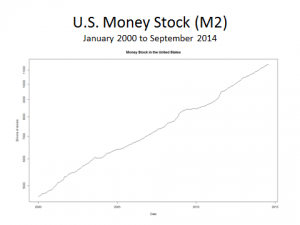 The line shows a fairly steady growth of the quantity of money in the United States. Not surprisingly, inflation has not taken off either. There normally has been a fairly close relationship between purchases of assets by the Fed and M2. What changed? First, the Federal Reserve now pays interest on reserves held by banks at the Federal Reserve. This need not explain the disconnect between the Fed’s purchases of assets by itself, but it does when combined with a second observation. The interest rate paid by the Fed on reserves is higher than the interest rates on similar risk-free assets. The second figure shows interest rates paid by the Fed on reserves, on Treasury bills and on Federal funds. Treasury bills are short-term government securities with zero risk of not being repaid. The federal funds rate is the interest rate at which banks borrow and lend reserves at the Fed among themselves. The solid line shows the interest rate on reserves, which has been 25 basis points (1/4 percentage point) for some time. 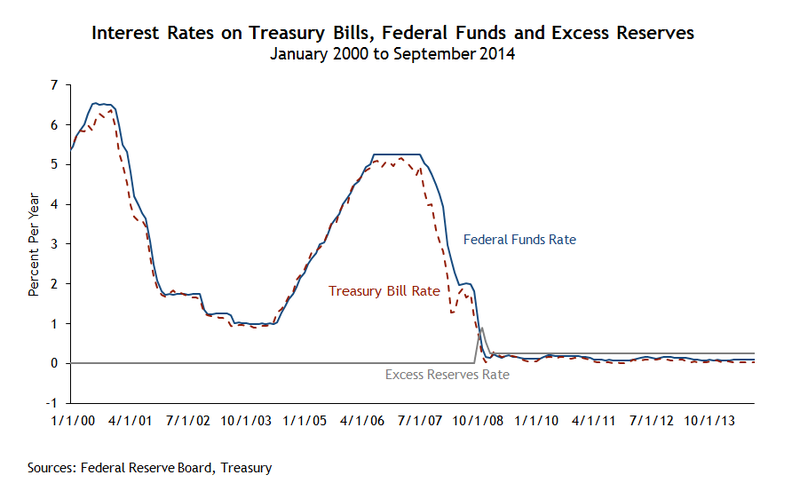 The rate paid by the Fed on reserves is greater than the rates on Treasury bills and federal funds. There are many things that can said about this, but the fact that the Fed is paying more than the Treasury for short-term funds is sufficient to explain why M2 has not increased. Both interest from the Treasury and from the Fed are risk free; balances at the Fed are better since they pay a higher interest rate. Banks have every incentive to hold excess reserves rather than Treasury bills. 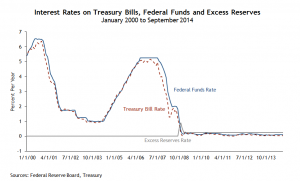 Why does anyone hold Treasury bills given these interest rates? Not everyone is able to earn interest on reserves at the Fed. Among other institutions, money market funds and the government-sponsored-enterprises Fannie Mae and Freddie Mac cannot earn interest on reserves. Banks are able to borrow funds from those institutions at rates less than the interest on excess reserves and then deposit the funds at the Fed, at which point the banks earn the difference between the 25 basis points (1/4 of a percentage point) on excess reserves and the lower rate at which they borrowed. In effect, the interest on excess reserves and the lower rate on Treasury bills set up an arbitrage for banks in short-term borrowing and lending. At least so soon after the financial crisis, banks are not likely to want to fund long-term loans by this very short-term funding. (Overnight funding of asset positions is exactly what got investment banks into difficulties in the Financial Crisis of 2008-2009.) The Fed ends up with higher reserves funding its asset purchases with no apparent effect on M2 as a result. The failure to expand bank loans is even less surprising since about half of the increase in reserves is held by U.S. branches of foreign banks. Most of these banks are not in the business of making car loans or similar loans in the United States and are not likely to go into that business simply because they borrow and lend short-term funds as an arbitrage. Even if they were so inclined, they are not likely to be inclined to fund relatively long-term assets by borrowing very short term, any more than U.S. banks are. Are Bitcoin Mining Pools a Natural Monopoly? Bitcoin relies on competitive mining to add new blockchains, thereby finalizing transactions and creating new bitcoins. If there is a monopoly in mining bitcoins, then Bitcoin fails to achieve a design goal of having an open process which does not rely on one trusted entity such as a private firm or a central bank. The monopolist must be trusted or else Bitcoin falls apart. Miners solve a computational problem: finding a hash less than or equal to a target value. Miners are participating in a contest to be first and the winner takes all. Miners face the risk every period that they will not win; if they lose, they receive zero. Miners reduce this risk by combining in pools of miners and sharing the payoff when a member of the pool finds a hash less than the target value. By itself, if all miners are risk averse, the optimal strategy is to form a single mining pool. Furthermore, even if there is more than one pool, a risk averse miner is better off joining the biggest pool if all the pools are the same in all other respects. The bigger the pool, the less risk an individual miner faces. There is a tendency toward a natural monopoly in mining due to this pooling of risk in mining pools. This does not imply that a monopoly is an inevitable result or even a particularly likely one. After all, there is more than one pool. The attached graph shows the distribution of payouts on July 4, 2014 for the prior four days. At times, Ghash.IO has included 40 to 50 percent of all mining activity. Why is there more than one pool? One answer would be that mining is on its way to becoming one pool and it just has not gotten there yet. A different answer consistent with differences across pools is that pools have different payout schemes and other characteristics which appeal to different miners. If differences across pools are the explanation for there being more than one pool today, there is no necessary reason there ever will be just one pool. A third answer would be based on the behavior of pools that become more dominant. As a pool becomes more dominant in miners’ computations, its terms to miners become less attractive. Possibly this third answer is part of the explanation as well. All of this is assertion with the underlying argument. The following discussion inevitably gets somewhat complicated to support the assertions. I have tried to make it as clear as I can and avoid technical details. Mining is organized into pools of miners. For some time, a single miner with one computer has not been able to mine on his own without highly variable returns. While mining is organized as a contest to be first, finding a hash less than or equal to the target hash is a matter of computing hashes and searching over an extremely large space to find a hash less than or equal to the target. Directed search is useless because nearby hashes bear no relationship to each other. Skill in searching is non-existent; search might as well be random over the space. The variance of returns from mining alone is substantial. Illustrative calculations show how high the variance is. One bitcoin mining calculator shows that a mining rig with a hash rate of 1,650 Gigahashes per second would break even on its initial outlay of $1495 after 86 days if it receives the expected revenue each and every day. It also shows that the expected time for the miner to find a block on his own is 507 days. If this block pays off roughly $600 for each of the 25 bitcoins, this is a payoff of $15,000. The implied variability in the time to payoff is huge. This can be seen in a way which illustrates the issue more directly. Suppose that the difficulty were constant at 16,818,461,371, the total number of mining Gigahashes per second (Ghash/s) were constant at 143,627,333 Ghash/s and the payoff of 25 bitcoins also were constant with a price of $600 per bitcoin. (Other than the prices, these are the parameters on July 4, 2104 and the price is roughly $600. Success in finding a winning hash would generate a payoff of $15,000. Nice. Suppose that a miner mines at the rate of 1,650 Ghash/s. This miner has a probability of 0.00115 percent of finding the winning hash value in any ten-minute period. Mining alone is risky in the sense that one might do quite well, and one might do quite badly. The probability of success in a ten-minute period is the same as the fraction of total Gigahashes performed by a miner. The probability that a miner with a hash rate of 1,650 Ghash/s would find a hash less than the target in any 10-minute period is 0.11488*10-2 percent at the current difficulty rate. If this probability of success is constant, mining for a year has a probability of one or more successes of 45 percent. Mining for two years has a probability of one or more successes of 70 percent. Conversely, the probability of not having received a single bitcoin is 30 percent after mining for two years. Even after mining for four years, the probability of not having earned a single bitcoin would be 9 percent. This is a rather bad outcome given the outlay for the mining equipment and the electricity. Mining in a pool reduces this variance. And the bigger the pool, the more the variance is reduced. In the limit, if all miners belonged to one mining pool and it always took ten minutes to find a hash less than or equal to the target, every miner would receive a fraction of 25 bitcoins equal to their effort every period. There would be no variability in return. The miner above would receive 17.23 cents every ten minutes, or $24.81 a day. While not grand, after a year this is $9057.19, which is not trivial given the likely outlay. This overestimates the actual likely revenue because the difficulty increases over time and the payoff in terms of bitcoins decreases, but the numbers illustrate the point. If everyone is in one pool, the risk of losing the contest to produce a successful hash is zero. In these simplified circumstances, pooling ones’ work with all other miners generates a 100 percent probability of earning $18,114.38 in two years. Mining alone has a probability of 30 percent of generating no return at all in two years. Even if a pool does not include all miners, the variability of the return will be less the larger the pool. In reality of course, belonging to a pool will not reduce the variance completely. I have abstracted from the possibility that a hash less than or equal to the target will be found in less than ten minutes or more than ten minutes. This is common risk and pooling risk across miners will not reduce it. It is just there in the environment. But pooling risk across miners can reduce the risk that an individual miner will face because they may not be first. Mining is a contest to be first. Why is it different than other contests, such as athletic contests or contests to become CEO of a company? In those contests, there are skill differences across participants. The contest to be first reveals qualities that have value to viewers, stockholders and others. The contest to find the winning hash is affected by the number of hashes that can be done on hardware run by individuals and will be affected by downtime which can be shortened by skill. Still, in the end, the search for a hash reveals nothing about miners themselves. Finding a hash less than or equal to the target does serve useful functions in the bitcoin economy: 1. finalizing transactions; 2. distributing new bitcoins. Those are quite important. It now would almost be traditional for me as an outsider to say that Bitcoin must change its operation to deal with this difficulty. I’m not going to say that. Rather, as I indicated in the first part of the blog, I think that other factors will prevent mining from being monopolized. Indeed, for reasons I indicated in my previous blog, I think that it is important that most pools be identifiable and develop reputations. 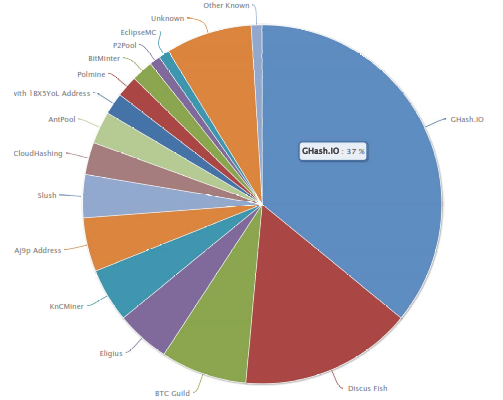 It’s the “unknown” mining pools that are more likely to cause problems than GHash. Sorry for this being so long but I don’t see how to make it shorter. This entry was posted in Bitcoin, Bitcoin mining and tagged Bitcoin, bitcoin mining on July 5, 2014 by gpdwyer.